SHERIDAN, Colo. — A massive sinkhole opened up and swallowed a Toyota RAV4 SUV on Oxford Avenue in Sheridan Tuesday evening. Sheridan police tweeted that the driver was OK and shared a photo showing the vehicle submerged in water 15 feet down. Police say the woman, Ashley Marisch, was able to climb out before the SUV fell. The sinkhole occurred on Oxford Avenue at the intersection of Natches Court amid a drenching thunderstorm. Police say the rain impacted a pipe below the pavement which gave way. “I've never seen anything like it," Adams told Denver7. "I didn't think I would go to work one day and see a car fall into the ground like that. It's pretty absurd. $40,000 down the drain literally, you know what I mean?" Marisch told Denver7 that she is still in shock and is thankful to a "guardian angel" who helped her out of the car just before it sank. "I am feeling very overwhelmed and still in shock but most of all I feel blessed and am thankful I had a guardian angel there to help me get out of the car. I hope he knows grateful I am that he was there to help me," Marisch told Denver7 via a text message. 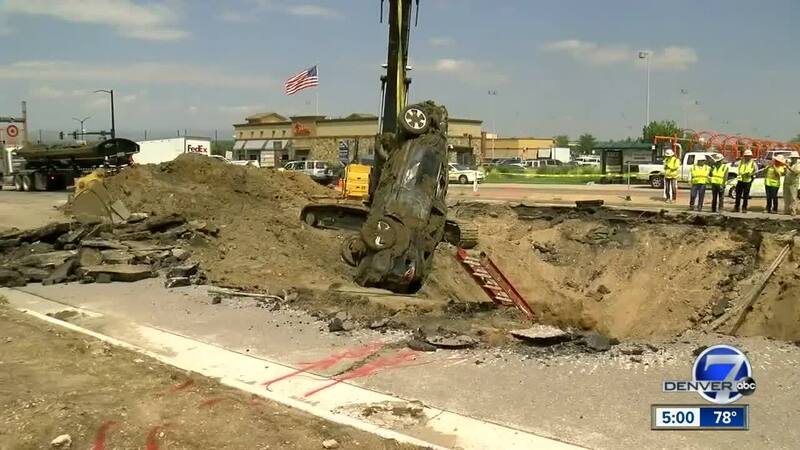 The city of Englewood released a statement Wednesday saying it was relieved no one was injured after the sinkhole opened and that the city's contractor, American Civil Constructors, is working to determine what caused the pipes underneath the road the fail. "We do know that the storm on July 24 can be characterized as a 100-year event. During the storm, an estimated 2.5 inches of rain fell in 30 minutes, which caused the pipe to pressurize at over 25 psi. The pipe was not designed for this pressure," city spokesperson Alison Carney said in a statement. "The City is committed to the safety of its community and is dedicated to providing measures to ensure that safety." This is the second time in about three years that a sinkhole opened up at the same intersection. 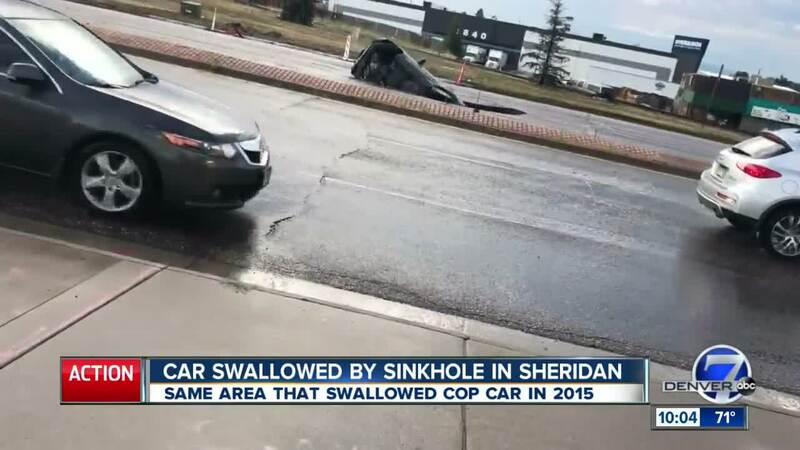 On June 15, 2015, a Sheridan officer driving his patrol car on Oxford Ave. was injured when the road gave way, and his patrol SUV fell 15-20 feet down. Sgt. Greg Miller managed to crawl out of the hole and was treated for his injuries. He responded to Tuesday's incident. Crews are at the scene and have closed off the area while they work to repair the road. Teams are concerned that a damaged gas line could rupture.